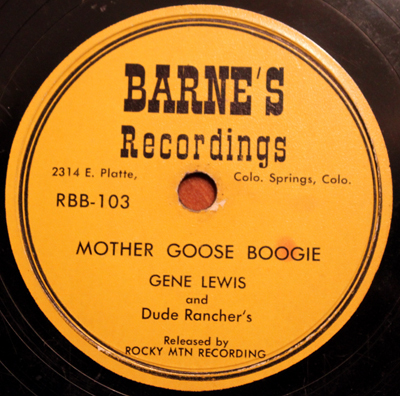 Earlier this year I acquired a 78 by Gene Lewis and the Dude Rancher's (apostrophe in band name is noted). "Mother Goose Boogie," issued on Barne's Recordings (apostrophe in label name noted) out of Colorado Springs, is a great hillbilly bopper. Give it a listen. The invaluable Rockin' Country Style website, notes a few Gene Lewis recordings from 1957-1959 (see here). But is the Gene Lewis who appears on those 45s, the same Gene Lewis who appears on this 78? Give a listen to those samples. Pretty darn similar. No telling, but wow, wouldn't that be something to uncover an unknown hillbilly rocker from Gene Lewis--one that has ties to Colorado? 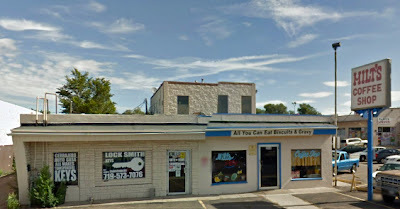 If you know of something that can help solve the mystery, let me know. 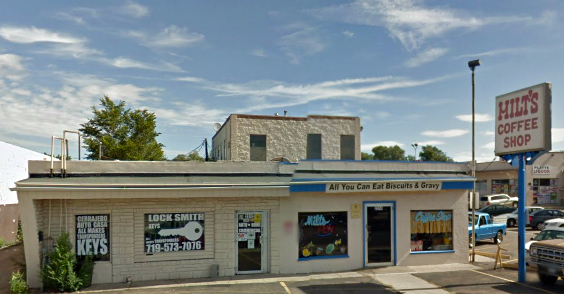 By the way Barne's Recording Studio, located at 2314 E. Platte, is now home to Milt’s Coffee Shop.